Wow, what a run of exciting new patterns. Between our Spring 2016 catalog that came out in March, new patterns for Haydenville and Longmeadow in April and all new designs for Goshen and Southwick in May we’ve introduced 13 brand new patterns to you in the last 3 months! On the off chance that you have missed any of these beauties we thought we’d pull together a little recap. Our Spring Catalog featured the Tulip Pullover in Stockbridge, the Sieberi Shawl in Longmeadow, the Leaves and Lines Afghan and the Grayson Baby Set in Haydenville, The Tink Cardigan in Sunderland, the Marguerite Scarf in Leyden and the Anemone Mitts in Goshen. A bright cheerful collection of knits for Spring from our own Valley Yarns Design Manager, Kirsten Hipsky! Then we partnered with some wonderful Indie Designers for a spate of all new pattern in April and May. Three gorgeous tops in Longmeadow, Ascending Leaves, the Easy Day Tee, and the Rose Sorbet Tank, the New Hope Pullover and All Dressed Up Stole in Goshen, the Vertical Pullover in Southwick and the Honza Baby Blanket in Haydenville. We asked these designers to let the yarn inspire them and boy did it! And don’t worry! We have even more exciting new designs ready to reveal in June! Here’s a sneak-peek at some of the featured yarns and Indie Designs you’ll see, but we’ll also release our Summer Valley Yarns Catalog with over 20 additional new patterns. Get your needles ready, you’ve got a lot of knitting in your future! And if you love Longmeadow or Stockbridge stock up now! 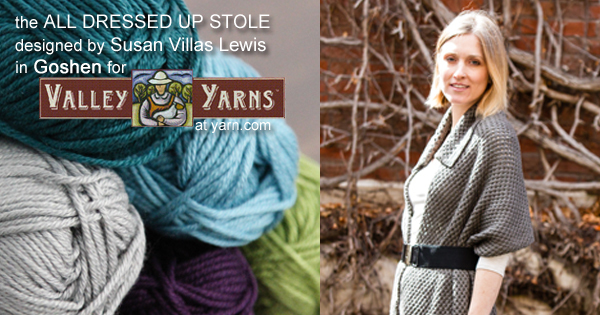 Sadly, both of these yarns have been discontinued and once our current stock is sold through, it’s gone forever. 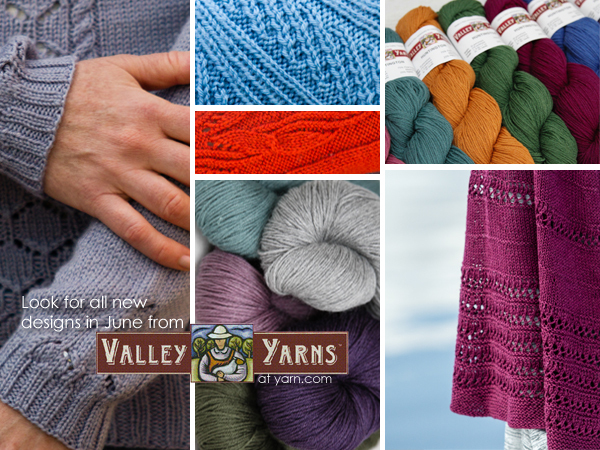 Not only is our Valley Yarns Goshen part of our May Anniversary Sale but we’ve also got exciting new designs in this yarn for you, and the All Dressed Up Stole is the newest! Drape this stole loosely over your shoulders and secure with a bright shawl pin over a floral summer dress, or let it hang long and loose with a stylish belt for a more tailored look. This piece is a truly versatile addition to your wardrobe that works as a perfect extra layer in Spring and Fall. Knit in Valley Yarns Goshen, the All Dressed Up Stole takes advantage of the silky drape of the yarn for a garment with beautiful fluid movement. With 25 colors to choose from you could go with an understated neutral like the sample, which was knit in #26 Steel, or add a bright splash of color to your summer wardrobe with #12 Lake or #10 Green Apple. Which color is calling your name? 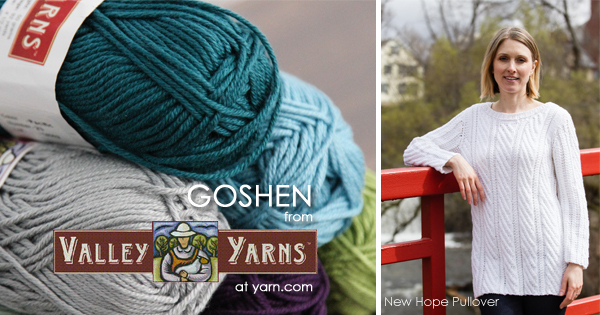 Whether you’ve been a loyal fan of Goshen since it debuted back in 2007, or you’re just discovering it this Spring, there couldn’t be a better time to get this yarn on your needles or hook! Goshen is a worsted weight blend of 48% Peruvian Cotton, 46% Modal, and 6% Silk that is milled and dyed for Valley Yarns in Peru. These long smooth fibers are blended together to enhance each other’s durability, strength and shine resulting in a yarn that has incredible stitch definition and longevity. This yarn is super resistant to pilling! The shine from the silk and modal, which is a rayon fiber made from recycled tree-based cellulose, really makes your stitches pop. Whether you’re making cables or an allover textured pattern with your stitches this yarn will showcase them beautifully. This unique mix of fibers also lends an incredible smoothness to the yarn that not only feels silky to the touch, but actually feels cool against your skin, making it perfect for warm weather projects. My older daughter is a big fan of wearing beanies all year long and she loves my hand knits hats, but she’s not a fan of wool hats in the summer. So I dug through our collection of Valley Yarns patterns and landed on the Embers hat. 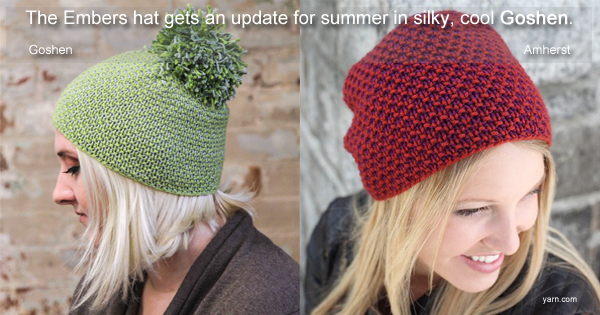 Originally knit in Amherst, this hat has a fantastically easy to remember 2 row repeat. You could easily knit this hat in one color for a beanie with great texture, but the magic really happens when you introduce a second color! While this may look like a complicated stitch pattern, or one that involves slipped stitches, you are only knitting with one color in each round and there are NO slipped stitches, just knits and purls! I chose the Green Apple and Seafoam colorways of Goshen for a subtle tonal quality. I used the same size needle called for in the pattern and knit to gauge. in the end I used less than a full skein of each color and used what yarn remained to make the pom pom. 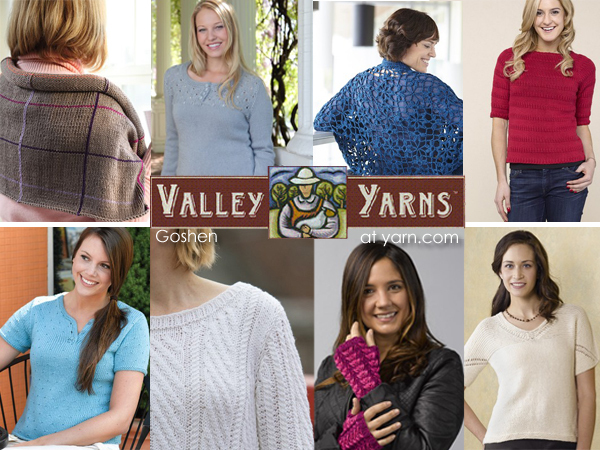 We’ve showcased Goshen in some of our most popular Valley Yarns patterns over the years. If you’re looking for everyday knit tops, accessories with a pop of color or cozy wraps, you’ve found the ideal yarn. What will you knit with Goshen? One of our original Goshen patterns or one intended for another yarn? Tell us all about it in the comments! Pick up a few skeins of Goshen today and give it a try. It’s part of our Anniversary Sale through May 31st, meaning you get each skein for only $2.79. That’s right, you could knit the Embers Hat for less than $6.00, or splurge a little and grab a bag, 10 whole skeins, for only $27.90! One of our newest patterns from Valley Yarns is the New Hope Pullover designed by Nadya Stallings. Knit in Goshen, our worsted weight, cotton/modal/silk blend, this a-line top is cozy enough for cool Spring evenings but cool enough for breezy, Summer beach days. Broad rolling waves fill the cable panels of this warm weather sweater, and the set in sleeve construction helps to give it structure and stability without hampering the flow and drape of the fabric. Pair this with jeans and chunky boots for a weekend hike or toss it on over your favorite shorts and tank when a cool breeze kicks up. Shown here in crisp summer white it would be equally stylish in classic Navy, a neutral like Fawn or Linen, or add a pop of color to your wardrobe with Green Apple or Persimmon. We asked Nadya to tell us a bit about herself and her work. I learned to knit, when I was 10. And it was not my mother who taught me, although she was doing all kind all crafts, but I was stubborn enough to not let her. Instead, I watched a TV show (in Russian) , called “Magic Yarn Ball”. That is how I learned to cast on the stitches, and I just kept doing it until I could without even looking at my needles. Since I grew up with just a few magazines that could give me some ideas of knitting, and not much else, I just was making them up for my own needs and desires. I had no feeling that it would be called “designing”! I moved to USA and looked through all those knitting magazines, I thought: “I know I could do this kind of work!’, but I just did not know how to approach the editors. In 2009, I was laid off, and very soon after that I received a catalog with announcement that they accept independent designers’ submissions. So, I went on-line, made my first submission and dared to send it out. Surprisingly, it was accepted! Inspiration comes from everywhere: watching TV, fashion shows, other designers’’ work, very often from some words, or music, and nature. Sometimes (more often) I come up with just a detail, an element, and try to figure out what silhouette would work with it. Very often, I develop a few variations of the design because I think the general idea would be good for them all. I tend to design garments with a bit more challenge, it makes the design work more interesting. Besides, I wear my garments, my daughter and granddaughter do too! Tell us about your design aesthetic. I admire people who dress themselves thoughtfully. I keep this in mind while designing, too. I do love vintage, but not being old-fashioned. I love to discover new color combinations that bring joy to my eyes. My recent favorite is the combination of different shades of brown with different shades of blues. And I love to design dresses and skirts! Or, at least the tops that are styled with skirts. I love to touch it, it feels so natural. I love to look at them, because the colors make me happy. I love how smoothly stitches slide from one needle to the next, and I love its drape. 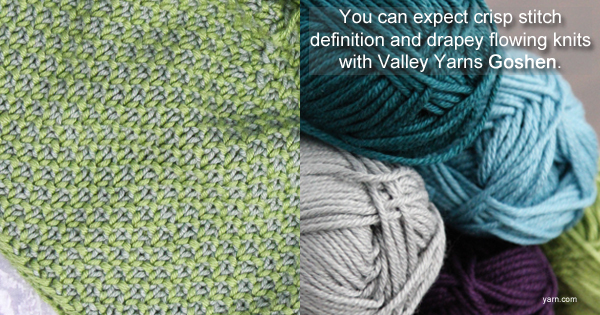 Valley Yarns Goshen is an ideal yarn for warm-weather knits! With it’s unique blend of fibers you get the sturdy durability of cotton, the memory and softness of modal , and the incredible shine and drape of silk. This versatile yarn feels cool against the skin but is squishy and cozy when knit into bouncy fun cables! What color of Goshen will you choose when you knit the New Hope Pullover? 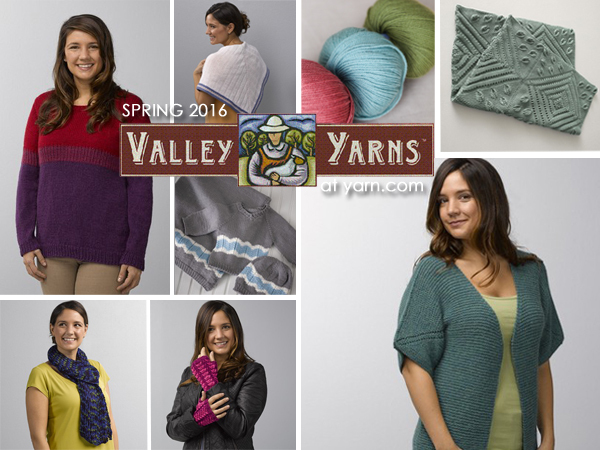 We’re looking for new Valley Yarns designs, from you! Hello Designers! We are looking for original, never before published, designs for Spring 2016 to showcase four of our favorite Valley Yarns. 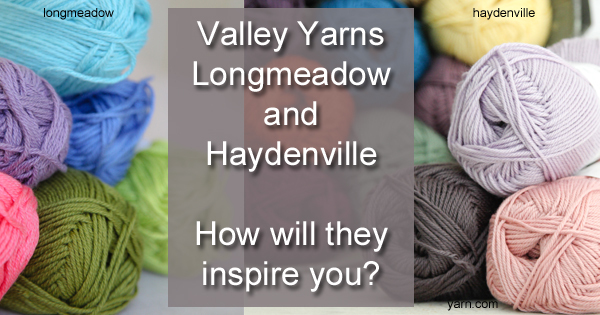 For April, we’ll be showcasing two great machine-washable Valley Yarns: Longmeadow, and the brand-new Haydenville! Think you don’t like knitting with cotton? Let Longmeadow show you cotton in a whole new light. Microfiber blended with cotton gives this yarn some wool-like forgiveness while being soft enough for even the pickiest recipient. A true DK weight, recommended at 5.5 sts per inch, and available in a sunny, colorful palette, Longmeadow is fantastic for baby items and multi-season garments and accessories. Looking for great softness in a worsted weight, machine-washable and dryable wool? Look no further than our brand new Valley Yarns Haydenville. Mostly merino and blended with microfiber, these 100g/220 yard skeins are perfect for blankets of all sizes and for all recipients who need to machine wash and dry. Large projects, baby sets, stuffed animals, hoodies and other often-washed articles are great for this yarn. Designers will be notified if their submission has been accepted, with yarn shipping out, by January 8th. Samples are due in-house by Friday March 4th. 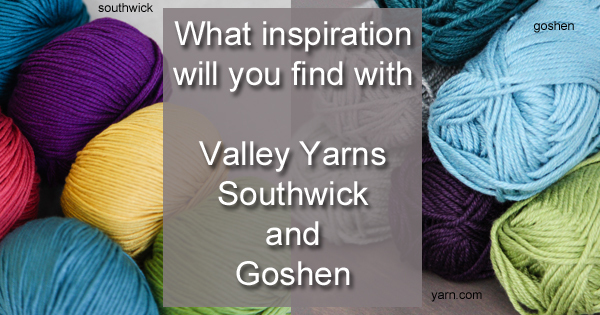 For May we’re highlighting two great warm-weather yarns: Valley Yarns Goshen and Southwick! Featuring Peruvian cotton, modal, and silk, Valley Yarns Goshen is a luxurious treat with loads of shine. Our heaviest cotton blend, we recommend knitting Goshen at 4.5 sts to the inch for structured women’s garments or dazzling accessories that make use of its weight and drape. Soft and drapey Valley Yarns Southwick, slightly lighter at 5 sts to the inch, is a perfect choice for flowing, airy garments, accessories and blankets. The combination of cotton and bamboo is smooth and cool on the skin, while the warm and sunny colors can’t help but make you smile. Designers will be notified if their submission has been accepted, with yarn shipping out, by January 8th. Samples are due in-house by Friday April 1st. All accepted submissions will receive yarn support, assigned by our in-house team. Valley Yarns will pay for the finished sample of the pattern on a sliding scale ($50–$200 depending on size and complexity). Payment will be made within 2 weeks of on-time receipt of finished sample. Valley Yarns and the designer will benefit from a 50/50 revenue share of all patterns sales during the exclusivity period, with quarterly payments made to the designer during the exclusivity period, preferably via Paypal. If your proposal is accepted, Valley Yarns requires a six month period of exclusivity after which rights will be shared and the designer may republish. Valley Yarns will retain their version of the pattern until such a time as they decide to discontinue the pattern or the featured yarn. 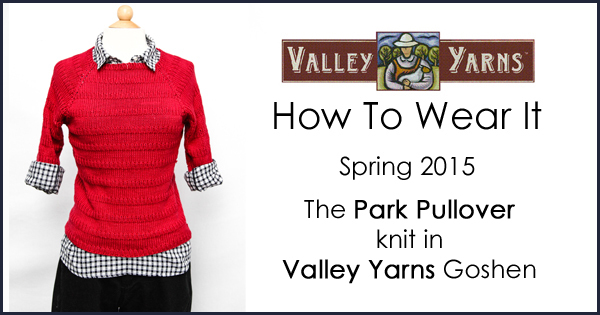 The Valley Yarns version of the design will be sold only through yarn.com, and may be used in social media and print media advertising, and may be featured in one or more of our catalogs. After the six month period of exclusivity has ended the designer will have full control of the Ravelry page and may use our photography as long as Valley Yarns is credited for the images. • your contact information, including your full name, email, mailing address, website and/or Ravelry designer page, and phone number. A short bio is encouraged if we haven’t worked with you before (tell us why you’re great!). Special reminder, please put everything you want us to see/read into the actual submission PDF, not into the body of your email. Also make sure that all parts of your submission are part of a single pdf. 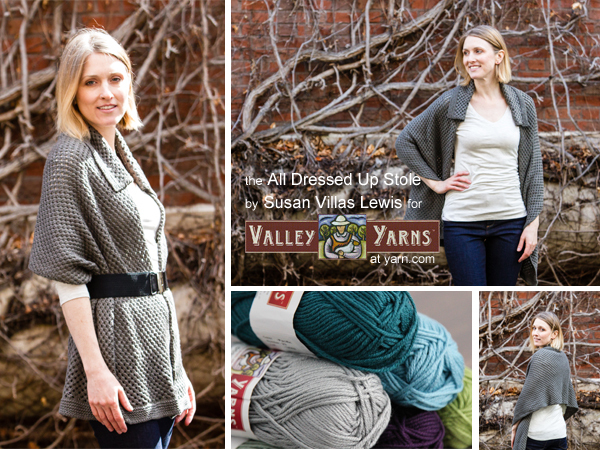 You can see past Valley Yarns designs here, and on Ravelry. • Decisions are made and designers with accepted submissions will be contacted approximately one week after the submission deadline. Submissions that are not accepted will be contacted 2-3 weeks after the deadline. 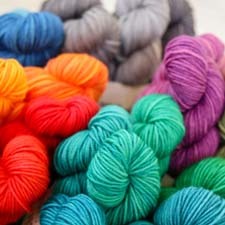 • If your proposal is accepted, Valley Yarns requires a 6 month period of exclusivity, after which shared rights begin. • You will need to grade/size your patterns, and format with our style guide (will be provided once a pattern is accepted) but they will be tech edited by our excellent team. • If you have any questions about sizing and schematic please see the Craft Yarn Council’s Guidelines. Valley Yarns is the in-house brand of yarn at WEBS – America’s Yarn Store and at yarn.com, with each yarn named after one of the towns in our beautiful Pioneer Valley. These carefully selected, affordable yarns are perfect for knitters and crocheters. 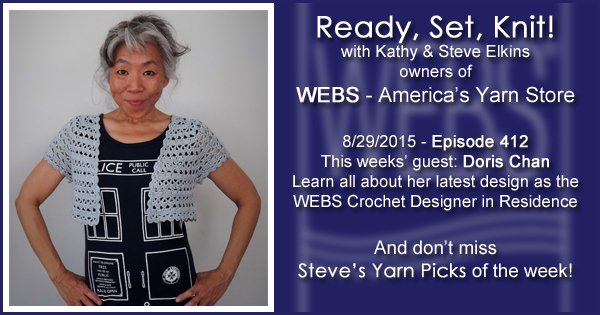 This week Kathy talks with WEBS 2015 Crochet Designer in Residence, Doris Chan! The talk about the surprising simplicity of her newest design, the Crocheted Goshen Jacket, and how sophisticated and elegant it can look. 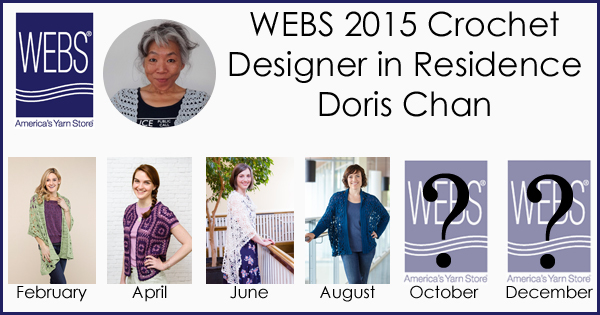 WEBS was a sponsor of the 2015 Crochet Guild Crochet Design Contest – check out the winners on their recap blog post. Valley Yarns Prescott – Limited edition yarn, get it while you can! Bathroom renovations are happening in our retail store. We are now restricted to a single stall for all our customers and employees. Please plan ahead for restroom stops before and after your visit to help alleviate lines for other customers and staff. We will be down to just one bathroom stall through the Labor day weekend – PLEASE plan ahead. Registration for Spinzilla opens Sept. 1st at 10am. Are you ready? As Winter finally begins to loosen it’s grip on New England we’re thinking about great, wearable Spring and Summer knitting, and the Park Pullover may just be the perfect project. The Park Pullover is based on one of our most popular children’s patterns the Picnic Child’s pullover. Alternating stripes of 1×1 ribbing and stockinette create a soft and casual sweater with flattering elbow-length sleeves. It’s as fun to knit as it is to wear, and since it’s top-down, the lengths of the sleeves and body are easy to modify! Knit in Valley Yarns Goshen you get the strength of cotton, durability from the Modal and a gorgeous sheen from the silk content. Available in over 2 dozen colors, you’re sure to find the one that’s perfect for your wardrobe! 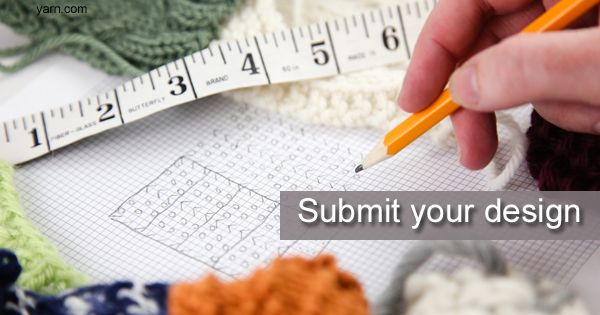 We’d love to see your finished garments! 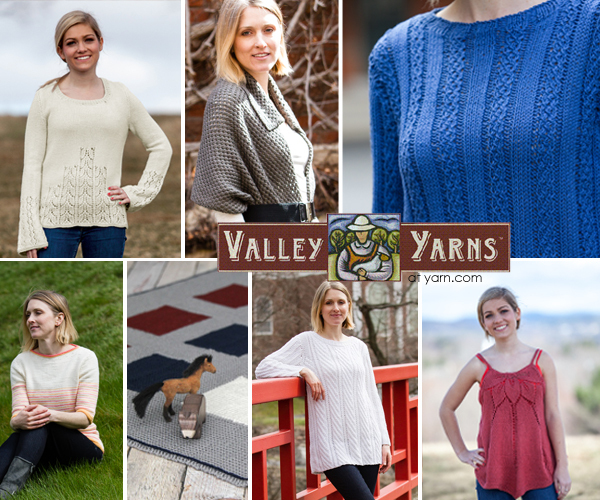 Anytime you’ve made a Valley Yarns pattern be sure to tag it with #VYwearit We may feature you here on the blog, highlight you on Facebook, or repost you on Instagram! Gifts to Make – When you still have more than a month to go. It’s that time of year when the holidays seem to start coming at us fast enough to give you whiplash, but there’s still plenty of time to finish some larger gift projects. Whether you’re looking for a great baby blanket, the perfect pillow for a splash of color, or a cozy wrap to take the chill off those late fall evenings, the Soft Landing eBook has just the right patterns for you. We’ve paired simple, but visually stunning stitches with some of the coziest fibers in our Valley Yarns collection. The Hen Plaid Wrap is knit in Goshen with a surprisingly easy crochet embellishment. The Snowdrop Baby Blanket in Longmeadow is knit on the bias for a fast finish. The Viola Plaid Pillow in Goshen is the perfect small project to practice the same crochet embellishment that’s used in the wrap and it’s great project to play with color. The Seed Plaid Throw in Valley Yarns Southwick achieves the look of plaid by combining textured stitches. And the Thaw Cabled Blanket in Valley Superwash is knit holding 2 strands for a cozy squishiness you won’t believe until you feel it. 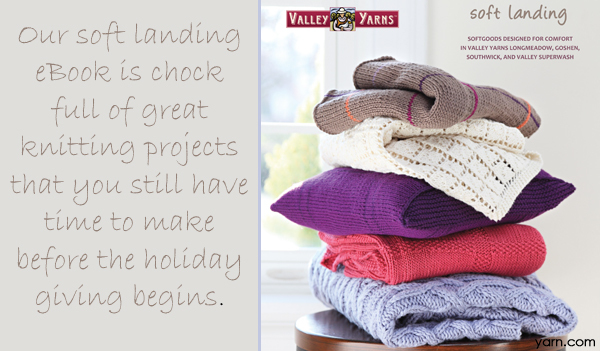 All of these patterns are available in the Soft Landing eBook for $11.99 and as individual PDFs for $3.99 each. Which would you knit first? Stretchy, lacy ribbing, silky-soft worsted weight Valley Yarns Goshen and a simple, “seamed scarf” structure make the Lake House Shrug a cinch to knit and a pleasure to wear. The shape is a simple rectangle – like a wide, short scarf – with seams sewn up a little ways on each end to form sleeves. It’s perfect for layering over sleeveless tops or T-shirts when you want a little more warmth on your arms and shoulders. You’ll only need 4-5 skeins of Goshen for the whole project, that’s less than 500 yds! And with over 2 dozen colors to choose from you can knit one for each day of the week and more. Which color is perfect for you?